Can we Trust Government Statistics on the Economy? “Everything depends on proper listening. Of ten people, who listen to the same speech or story, each one may well understand it differently - perhaps only one of them will understand it correctly.” Traders were anxiously waiting to hear whether Mr Bernanke would send a crystal clear signal about another round of “Quantitative Easing,” (QE), designed to artificially inflate the value of the stock market, with the principal aim of defending the wealth of the financial aristocracy. At the end of the day, it was generally understood that while the Fed hasn’t made a final decision so far, Bernanke was careful to keep the dream of QE-3 alive. “The Committee will continue to assess the economic outlook in light of incoming information and is prepared to employ its tools as appropriate to promote a stronger economic recovery in a context of price stability,” Bernanke said. Adding a new twist, he said the September policy meeting will be extended to two days, instead of just one, to allow for a fuller discussion, suggesting a pleasant surprise (ie QE-3) could be in the offing next month, for today’s buyers of risky assets. In last year’s Jackson Hole speech, Bernanke clearly telegraphed QE-2, a plan to buy $600-billion of US Treasury-bonds, used to monetize the debts of the US-government and spur more spending by the wealthiest Americans. Immediately afterward, the S&P-500 Index started rising and gained +28% until May 2011, when it leveled out. As if by déjà vu, Bernanke ignited yet another powerful rally in the stock market, by hinting it is safe to buy risky stocks. He dispelled fears of a looming “double-dip” recession, by simply saying he is optimistic about the outlook for the US-economy, even after the stock market took a drubbing in the month of August. “With respect to longer-run prospects, my own view is more optimistic. The growth fundamentals of the United States do not appear to have been permanently altered by the shocks of the past four years.” Immediately after uttering these words, the Dow Jones Industrials found good support at the psychological 11,000-level, quickly reversed an intra-day -200-point loss, and managed to close +134-points higher on the day, thereby forcing short sellers to scramble to cover losing positions. 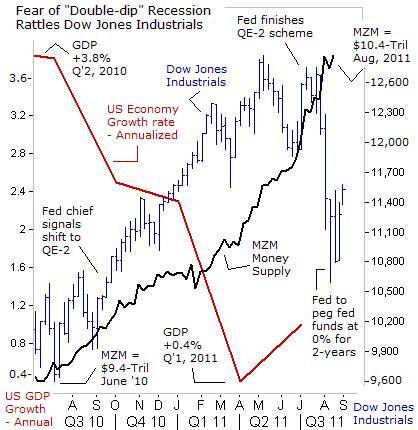 It is very interesting to note, that a year ago, Bernanke was telegraphing QE-2, as the Dow Industrials were teetering at the psychological 10,000-level, and quivering on latent fears of a “double-dip” recession. 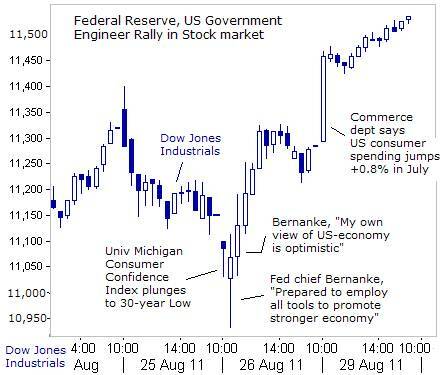 This year, Bernanke was defending the Dow Industrials at a slightly higher 11,000-level, by hinting at QE-3. Whereas a year ago, the yield on the Treasury’s 10-year note hit a bottom at 2.50%, this year it found a bottom at 2-percent. Nowadays, most traders and the public at large are mentally conditioned to look to the White House and the Federal Reserve, to ride to the rescue of the US-economy, whenever there is a crash in the stock market, or when the economy runs into a rough patch. The Fed’s willingness to print trillions of US-dollars is part of Bernanke’s unprecedented effort to keep the stock market artificially inflated and trending higher along an upward trajectory. 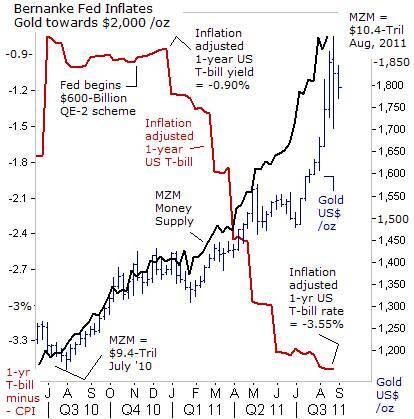 It’s dubbed the “Bernanke Put,” and at its core is the explosive growth of the high-octane MZM money supply. It’s expanded by roughly $1-trillion since April 2010. Even as the US-economic growth rate was stumbling towards stagnation in the first half of 2011, the hallucinogenic effects of QE were lifting US blue-chips higher. As the MZM money supply reached a record $10.45-trillion in August 2011, the Dow Industrials rose to the 12,750, before the rally was rudely interrupted – by the specter of a “double-dip” recession. Bernanke and Goldman Sachs alumni, NY Fed chief William Dudley paid no heed to angry criticism from Brazil, China, and India, Tea Party Republicans and other Fed officials, that the Fed’s QE-2 scheme had also lifted North Sea Brent crude oil to $115 /barrel, and contributed to a doubling of corn and soybean prices, thus stifling the global economy, with a massive tax on producer profits and consumer incomes. In fact, the “commodity shock” generated by the Fed’s QE-2 scheme is one of the primary causes behind the anemic state in the US-economy, averaging just +0.7% growth for the first half of 2011. The Fed has already kept short-term interest rates locked near zero for 2-½-years, and says it would keep the fed funds rate pegged near zero-percent through mid-2013. Such a move is hurting American retirees, earning about $368-billion /year less on their bank CD’s compared with a few years ago. Also, a prolonged time period of unlimited and nearly free credit is a huge windfall to the banks, hedge funds, and speculators of all sorts, who can now feel more confident that the Fed will underwrite new bubbles in the markets. Everything was proceeding nicely, for the financial aristocracy, until the Fed decided to take a brief hiatus from money printing. Once the printing presses turned silent on July 1st, the QE addicts on Wall Street began to suffer from severe withdrawal symptoms. The stock market bulls suddenly got wobbly knee caps, and the Dow Jones Industrials crashed -2,000-points, without warning. Likewise, the S&P-500 Index plunged -18% lower, tumbling dangerously close to the threshold of bear market territory. Quickly, the illusions of increasing wealth on Wall Street, conjured-up by the Fed’s hallucinogenic QE-drug, began to wear off. Despite all of the Fed’s manipulative antics, designed to bolster Wall Street, traders still get very nervous at the first signs of a soft patch in the fragile US-economy. Stock market bulls need constant reassurance that the safety net of the “Bernanke Put” will always be there to rescue their investments, when risky bets go sour. Stock market bulls want to know the “Plunge Protection Team” (PPT), will intervene in the stock index futures market if necessary, and won’t allow a nasty correction to morph into a bear market. At Jackson Hole, Bernanke gave a wink and a nod to his audience, letting them know that the upcoming batch on US-economic data would be much better than was widely expected. Sure enough, on August 29th, the Commerce Department backed-up Bernanke’s optimistic view of the economy, by reporting a surprising +0.8% increase in US-consumer spending in July, the biggest increase in two years! Furthermore, US-government apparatchiks said Americans withdrew $55.8-billion from their savings accounts, in order to finance their purchases of automobile and other big ticket items. As such, Americans are spending money at an annualized rate of $10.75-trillion, the highest figure in history. That’s +5.1% higher than a year ago, increasing at a rate not seen since the days preceding the “Great Recession” in mid-2007. The public is told US consumers dipped into savings in July 2011 in order to go on a spending spree, even when the U-6 jobless rate hovers at 16-percent. On Aug 29th, the government’s glowing data on consumer spending, combined with the Fed’s hint at QE-3, lifted the Dow Jones Industrials +254-points higher to the 11,540-level. Likewise, the S&P-500 has rebounded by +10% above its crash bottom low, to close at the 1,210-level today. With the Fed hinting at QE-3, equity traders were able to set aside worries about the yield on Greece’s 2-year note, which spiked up to a record 48% earlier in the day. Do you believe in conspiracy theories? Sometimes they are difficult to refute. “Imagination is more important than knowledge”, the brilliant Albert Einstein used to say. Imagine for just a moment that the Dow Jones Industrials has become a key instrument of national economic policy, and that by “actively managing” its direction, the US-government could impact the wealth of tens of millions of US households, and by extension, influence consumer confidence and spending. One of the most powerful weapons at the disposal of the US-government is the ability to massage economic data, in order to jig the markets in a desired direction. 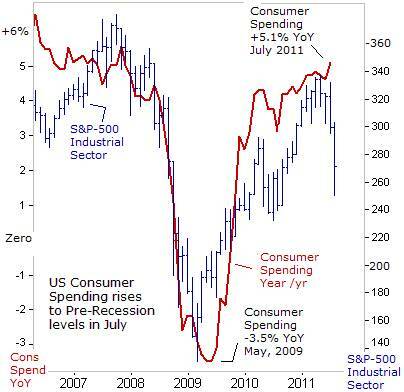 The government’s data on consumer spending is the exact opposite of what Americans are telling pollsters. 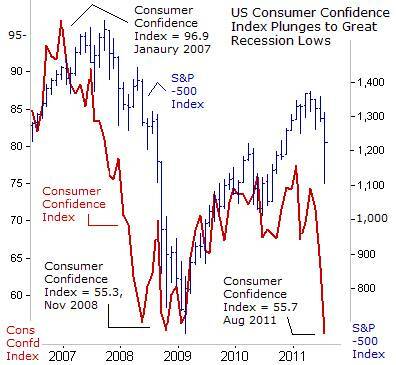 For instance, on August 26th, 2011, a widely followed survey conducted by Thomson Reuters and the University of Michigan found that US-consumer sentiment had plunged to a reading of 55.7 in the month of August, - its lowest level since November 2008, tumbling to the depths of despair from the Great Recession. The consumer confidence index fell sharply from 63.7 in July. Two-thirds of all consumers reported that the economy had recently worsened, and just one-in-five anticipated any gains during the year ahead. Three-quarters of respondents expected bad economic times, just below the all-time peak of 82% in 1980. Consumer buying plans also fell plunged to their “Great Recession” lows, and 46% of respondents said they expected unemployment to rise. According to a new Associated Press-GfK poll, a stunning 86% of US-adults say the economy is in poor shape, up from 80% in June. Half of those interviewed, (49%), said it worsened just in the past month. Only 27% responded that way in the June survey. Some 75% in the poll said the country is heading in the wrong direction, up from 63% in June. At a time when Americans are increasingly worried about a weak job market, higher costs for food, clothing, and gasoline, and a weak housing market, the Conference Board said its Consumer Confidence Index fell to 44.5, down from a revised 59.2 in July, and the lowest level since April 2009. Another measure that assesses shoppers’ outlook over the next six months collapsed to 51.9, down from 74.9 last month. Yet US-government apparatchiks are telling traders in the stock market, a completely opposite “feel good” story. Yes, it’s true that US-corporate profits have more than doubled from the depths of the Great Recession, to an annualized rate of $1.54-tillion in Q’2 of 2011. Corporate America’s cash stockpiles are at all-time highs and its balance sheets are in much better shape now than at any time in the past decade. Last month, Google announced Q’2 net income of $2.5-billion and Apple made $7-billion, nearly doubling its earnings from the same period a year ago. But US-companies are refusing to use their stash to hire more workers. Instead, new plans for mass layoffs have only accelerated. Corporate profits were generated through the elimination of 8.4-million jobs, and so-called productivity gains, that have left US-workers desperate for any work available, accepting of lower wages and cuts in medical benefits. At the same time, there are now almost 46-million people in the United States on food stamps, roughly 15% of the population. That’s an increase of +74% since 2007, just before the financial crisis and a deep recession led to mass job losses. The vast majority of the US-public has lost faith in Wall Street, and has withdrawn about $2-trillion from the stock market. Instead, it is estimated that the wealthiest 10% of Americans are now left in control 80% of the outstanding stocks. Furthermore, nearly 60% of the trading volume on the NYSE and Nasdaq is now handled by high frequency computerized Black Box traders, and in the first half of August, they accounted 75% of the volume. A generation ago, volatility was measured in days. Now huge moves up, and then down, can happen in a matter of minutes. The moves are so fast these days because computers programmed to analyze hundreds of variables and are executing huge trades without any human intervention. Instead of trying to outsmart computers, many investors have turned to the reliability of Gold, as the best hedge against abusive central banks that are addicted to money printing. Gold is also a prime beneficiary of the “Bernanke Put.” One of the untold secrets of QE-2, was the sharp drop in the inflation adjusted 1-year T-bill rate, as the Fed drove short-term interest rates to -355-basis points below the inflation rate, - the lowest in history, and locked far below the fed funds rate, which is pegged above the surface at zero to 0.25-percent. Combined with the massive expansion of the MZM money supply, one should not be surprised that the Gold market went parabolic in the past few months. “By this means, government may secretly and unobserved, confiscate the wealth of the people, and not one man in a million will detect the theft,”-- John Maynard Keynes.